Delirium Studios, Evolution S.L, abylight S.L. I would venture that most of you hadn’t heard of The Delusions of Von Sottendorff and his Square Mind before you clicked this review. I bet even more of you would be surprised that it was a 3DS exclusive, developed and published by small Spanish team Delirium Studios. Hell, even I wouldn’t have heard of this game had I not received a press release for it and decided to roll the dice and take a chance on the game. 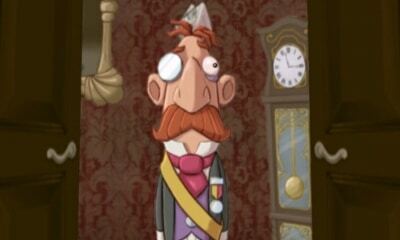 The Delusions of Von Sottendorff is a 3DS puzzle game where you play the titular Baron Von Sottendorff and help him through a variety of peculiar challenges. What’s cool about that, is the character of Baron Von Sottendorff was a real 20th century aristocrat, and the game itself is loosely based on his journals. While Delirium Studios extrapolated on his physical appearance, since first hand accounts don’t really tell us what the writer looks like, the events that occurred in his life, which are revealed in the game, are all based on reality. So, the question then is whether or not this indie puzzle game is any good? The answer is complicated. Join me as we venture into insanity together! 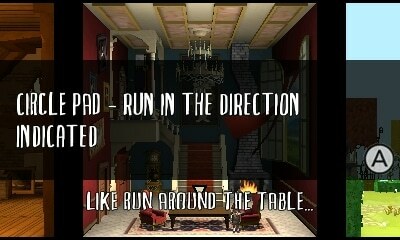 The game itself all takes place in Von Sottendorff’s expansive mansion. You see, he is afflicted by horrible memories, and possible madness. You the player are tasked with helping him uncover his repressed memories, despite what the voices he hears are saying. Yes, somebody is speaking to the Baron from the moment you start the game, though it’s unclear if the voice represents a real person, his inner sanity or something else. Regardless, the basic rule of thumb is, if the voice tells you not to do something, do the opposite! You won’t beat the game otherwise. Don’t you be bossy, invisible voice. Baron Von Sottendorf does what he wants! As for how the game itself plays, it’s broken up into 8 chapters, all composed of 5 levels, making a grand total of 40. Each chapter takes place in a different setting, such as a graveyard, a hedge maze, a factory and more. Your goal in each level is to collect a key, which opens the exit, as well as a puzzle piece. The puzzle pieces gradually reveal a image from Baron Von Sottendorff’s childhood, slowly showing us events that shaped him. 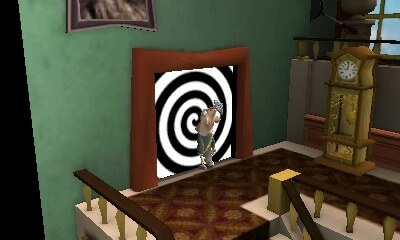 Additionally, each level also has 5 hidden memories which are represented as photographs. By collecting all 5 in any level, you will be rewarded with an additional life. They also serve as currency to unlock artwork, videos and musical tracks. While in theory this would be a great method to offer replay value, it’s hampered by the odd decision to lock worlds after you’ve beaten the game. So if you want to collect everything, make sure to do so before moving on to the next world. The gameplay itself is one of the strong points of the game, though not without its rough edges. 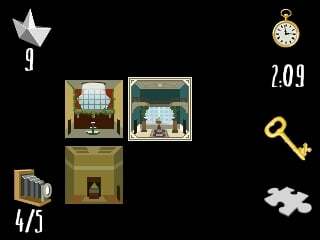 In order to beat any level, you’ll need to manipulate it by moving the square rooms around. Imagine you can make your way from one room to another, but the third room is out of reach. Fixing that is as simple as moving them around, rubix cube style. As long as you have a door that leads into another room, you’re golden. 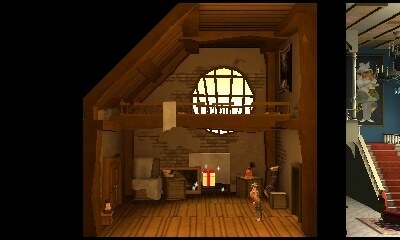 It gets more complex, as more and more rooms are added, but the basic mechanics work quite well. Just keep in mind that the touch screen will show which rooms are connected, cause when rooms have multiple exits, things can get very complicated. More than once I thought I could go from one room to another, but the doorways weren’t quite aligned right. My frustration was also minimized by a visual effect where the doorways light up briefly when aligned properly. 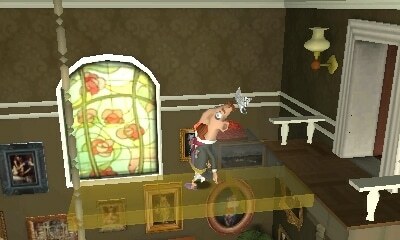 Besides moving rooms around, you also use the Baron’s trumpet. By honking your horn, you can make invisible platforms spring to mysterious life, allowing access to previously inaccessible areas. However, there is a proximity limit to the horn’s usefulness, so it pays to run around different parts of rooms, even different elevations, to see if platforms appear. My only complaint with regard to the horn is that it has a maximum of 9 uses. This seemed odd, since it is such a requisite mechanic, and it seemed even stranger because you can find additional horns throughout the levels. Why the game didn’t just allow infinite uses of it baffles me, but it’s not that big of a deal. What is a big deal are the enemies and timed levels. These golden platforms spring to life with a simple blow of your trumpet. While you can take as long as you want in most levels, there are several that are timed. You’ll especially find a lot of these late in the game, and I found them all to be a headache. More than anything, they brought to the forefront my complaints with the platforming in the game. Sure, it works fine when you have as long as you want, but when every second counts, the laggy platforming becomes particularly frustrating. For example, many times I would jump and land on the edge of a structure, only to slide off a second later as I tried moving the camera around. While you can technically move the camera all about to help, and even minimize and maximize the display, it constantly hits the walls of rooms. Sometimes that would mean I would need to have the camera at the closest magnification, meaning I would run blindly into traps or fall off platforms. This is an even bigger problem when you take into account that levels have enemies milling about. Some are easy to avoid, but others will doggedly pursue you, some are invincible and some can even fly. While I don’t mind enemies in puzzle games, I typically find them unnecessary, especially when you’re rushing about. Frankly, though the enemy design in Delusions of Von Sottendorff is cute (especially the wine drunk giant mosquitos), I could have ultimately done without them. Another minor complaint I have with the game is the load times. 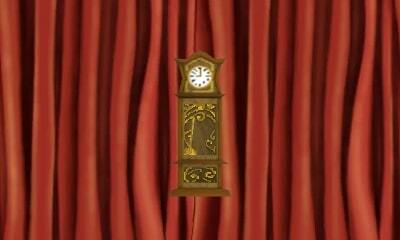 Any time you select a level or go back to the hub area, a load screen with a grandfather clock will appear. Not only is the movement of the clock sluggish, but the load screens can last anywhere from 10 – 15 seconds. It’s not that long, sure, but when you keep seeing it again and again, it can become frustrating. The only reason this facet doesn’t bring the score down, is because I recognize Delirium Studios is a small indie studio, and realize they may not have the resources to streamline or polish certain aspects of the game as much as they may have liked. While I have my complaints about the gameplay, there is one area where The Delusions of Von Sottendorff and his Square Mind absolutely shines, and that is the music. 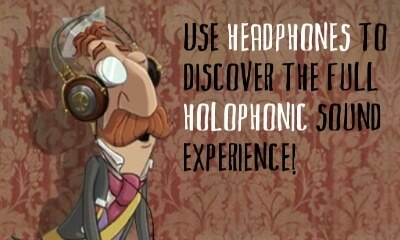 Delirium Studios actually went and worked with another studio to compose the music, and recorded it to resonate with a holophonic mike. While I can’t confirm that headphones improved the experience that much, the main theme for the game is fantastic and catchy, and there was nary a song that I disliked. The music does a great job of setting the proper tone for this quirky game, and also sets the right emotional state for the Baron. Do yourself a favor and watch this video to see how the music in the game came about. It’s more than worth a quick listen. My playthrough with The Delusions of Von Sottendorff was a mixed one. I enjoyed the premise, was captivated by the promise of secrets to come, but ultimately disappointed by the revelation at the end of the game. The gameplay is a mixed bag, mostly because of laggy platforming and occasionally wonky camera, but the music is a standout high point. For $12.99 I spent a grand total of 9 hours with the game, and despite my complaints, found the whole experience endearingly weird. While The Delusions of Von Sottendorff and his Square Mind is definitely not for everyone, I’d recommend it for 3DS puzzle fans or those who love super niche indie games. Overall, I was happy with my time, and look forward to future games from Delirium Studios. Previous Post:Operation Recap Ep 01: The Return!